Dusty Button photographed by Nathan Sayers for Pointe. This is Pointe's February/March 2015 Cover Story. You can subscribe to the magazine here, or click here to purchase this issue. On a rainy October morning, Boston Ballet's Dusty Button sails through a pas de cinq rehearsal for Swan Lake. The variation is long and thankless, full of uncomfortable jump sequences and tricky transitions from pirouettes, yet Button, newly minted as a principal dancer, glides through it sunnily in a trial pair of Bloch pointe shoes. Unusually, she is not winded and is able to joke with assistant artistic director Russell Kaiser as he gives her notes. “I think I just did a four-step soutenu," she laughs good-naturedly, hands on her hips. “Well, you are always overachieving, Dusty," teases Kaiser, giving voice to what could be the understatement of Button's last few years with the company. Two catchphrases screen-printed onto the coverups of Button's dancewear line, Ribbon&Rosin, say it all: “Work until your idols become your rivals" and “Remember why you started." At 25, she appears to be following her own advice. After dancing at Birmingham Royal Ballet, Button was hired into Boston's corps in 2012, where she was promoted to soloist and then principal within two years. But her path to the top has been anything but traditional, and shows a keen entrepreneurial instinct that leverages growing up as a competition kid. In addition to designing her clothing line, she is a budding choreographer who teaches at dance conventions on the weekends. Her Instagram feed, at last count boasting 46,400 followers, and her brand-new website, worldofdusty.com, make it clear that she has a vision for branding herself that is more like a young Hollywood starlet than a ballet dancer. From the competition circuit to The Royal Ballet School, Button has grown from a precocious, talented student into a strategic artist and businesswoman. Dusty Button and Bradley Schlagheck. Photo by Rosalie O'Connor, Courtesy Boston Ballet. Button, an only child, was raised in Myrtle Beach, South Carolina. She spent most of her childhood winning national titles at competitions such as Showstopper and New York City Dance Alliance. But in addition to jazz, hip hop and tap, she was also schooled in the Royal Academy of Dance syllabus. RAD prepared her for a year-round invitation to The Royal Ballet School's Upper School in London at 15, but the prohibitive cost kept her in the U.S. Instead, after being scouted at Youth America Grand Prix, she was offered a scholarship to American Ballet Theatre's Jacqueline Kennedy Onassis School and moved with her mother to New York City. After a year and a half, she was invited to fill in for an injured member of ABT's Studio Company and was soon asked to officially join them. But in a surprising move, she turned the offer down in order to enroll at The Royal Ballet School, this time on a mix of scholarship and sponsorships. Button wanted more training due to a late start in pre-professional ballet. Towards the end of her year at RBS, she auditioned for Boston Ballet. “I saw this dynamic girl who had a jazz background," says artistic director Mikko Nissinen. “I liked her but didn't have anything to offer her." After her year-end RBS assessments, which were open to company directors, the 18-year-old received a contract with Birmingham Royal Ballet. 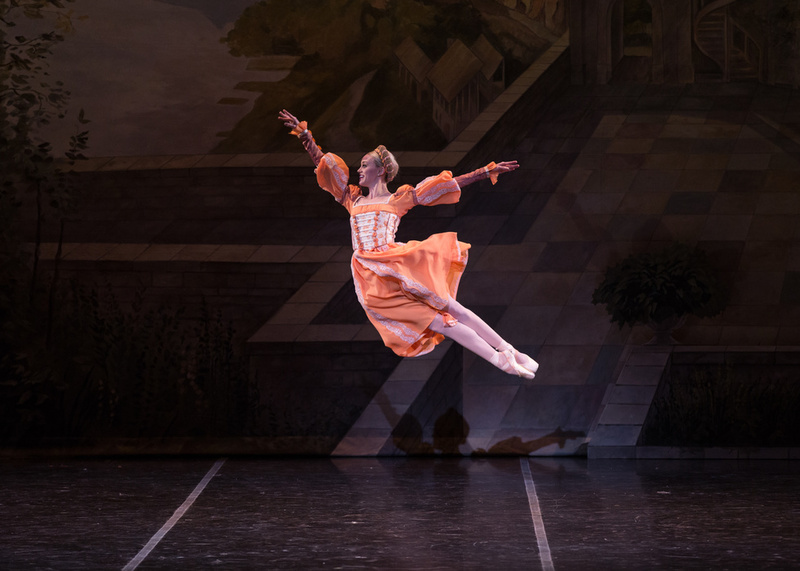 During her three years at BRB, Button excelled, earning lead roles in both story ballets, such as David Bintley's Cinderella, and contemporary repertoire. But she felt frustrated by the seniority-based hierarchy. On a quest for new challenges and a home where she could progress more quickly, she took what many dancers might deem a huge risk: She left at the end of the season without first signing another contract, and returned to the U.S. ABT heard she was back in town and offered her some freelance work. Yet she zeroed in on Boston Ballet. Having not received a contract years before, she saw the company as a challenge and auditioned again. Dusty Button in Miko Nissinen's "Swan Lake." Photo by Rosalie O'Connor, Courtesy Boston Ballet. “When she came back, her strength was elongated, and she was more developed as both a dancer and a human being," says Nissinen. After finishing up with her commitments at ABT, she joined Boston mid-season. Ballet master Larissa Ponomarenko helped Button find her footing after joining the company. “When I think of Dusty, I see a vibrant human being who is eager to succeed with anything she touches," says Ponomarenko. “She always gives a hundred percent of herself." Button seems to have easily blended into BB's diverse repertoire, performing both her dream role of Gamzatti in La Bayadère and leads in Alexander Ekman's Cacti and José Martinez's Resonance. “There's no limitation to what she can do," says Nissinen. Having reached her professional dream of becoming a principal, says Button, “my goals are now related not only to my career but the lifestyle surrounding it. I want to build a life I never need a vacation from." With this in mind, it seems fitting that she and her husband, both self-described Anglophiles, would make a home in a New England penthouse condo that dons more than a few Union Jacks among Ducati motorcycles and a Ferrari. Button seems to bring a contemporary dancer? 's mindset to everything she does. She often looks for inspiration outside the studio, such as watching motorcycle racing with her husband. “?As dancers, we are constantly surrounded by people who think the same thoughts, and it? 's easy to become routine,?" she says. “?What was the last new thing I learned? What can I do more of today than yesterday??" Button? 's ambition to be different drives her, she admits, “?to see my path clearly as the one opposite of the most traveled.?" Dusty Button in Balanchine's "Rubies." Photo by Rosalie O'Connor, Courtesy Boston Ballet. While this type of independent thinking has helped shape her into a dynamic and versatile dancer, it's also caused controversy. When she first joined the company, she preferred to do her own contemporary warm-up and run through her choreography before performances in lieu of company class. When Nissinen asked her to be in class more, Button felt she needed to understand his reasoning and asked if her choice was affecting her technique. She applies a similar interrogatory process to coaching. “You have to take what they are saying, but you can't just be a carbon copy,"she says, seemingly unaware of the raw talent that has allowed her to show such personality in the face of authority. Nissinen'?s explanation that her new rank came with new role model responsibilities made sense to her and helped her reframe her approach to the daily practice. ? "When she first came, she wasn? 't always in class,"? Nissinen explains. ? "But we are serious about class here. We play team basketball. Once she understood the philosophy, she embraced it wholeheartedly.?" Now, she dances full-out from the first plié, adding a level of difficulty to every barre combination? : an extra fouetté turn during rond de jambe en? l'air, or dancing adagio on demi-pointe. Stripping down to just a leotard and tights in the center, she repeats her grand allégro combinations with the men, flying just as high. At Boston Ballet's BB@home black-box event last year, Button showcased her choreography, its vocabulary an exciting mix of her contemporary and ballet heritage. She hopes to eventually create full-length works for ballet and contemporary companies around the globe. As she propels herself forward at warp speed, Button continues to show a nascent ability to reinvent herself. With new footholds in choreography and business, in addition to a principal featured role in Lady of the Camellias this spring, Button is redefining what it means to be a ballerina in the new millennium—and her enterprising spirit is proof that there is reward in such bold self-creation.